Looking for a cheap Amsterdam break but don't know where to start? Read on to find the cheapest places to stay, to eat and to hang out in the Venice of the North. Also read other ohter tips for keeping it cheap in Amsterdam. The most inexpensive way to arrive for your cheap Amsterdam break is by bus. Eurolines coaches have an office in the centre of the city and their lines connect Amsterdam with many major European cities. Prices are much lower than arriving by train or plane and the coaches are pretty comfortable, which, considering the possible length of your travel time, is a very good thing. The other cheap option for getting to Amsterdam is a low cost airline. Amsterdam Schiphol Airport is one of Europe's largest travel hubs and many airlines fly into it. BMi, Cityjet and Czech Airlines are just some of the airlines that can offer very reasonable rates if you book your tickets well in advance. 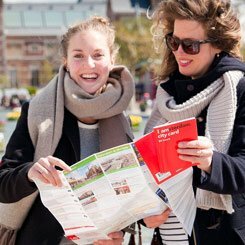 Read our tips for finding cheap flights to Amsterdam and use our list of airlines where you'll have the biggest chance of finding cheap tickets to Amsterdam. It wouldn't be a cheap Amsterdam break without somewhere low cost to lay your head, and Amsterdam has plenty of options for that. If you're travelling to the city during the warm summer months, one great choice is to camp. Camping Vliegenbos, at Meeuwenlaan 138 across the river in Amsterdam Noord, is located in a picturesque forest and gives you the chance to stay in Amsterdam for under EUR 10 a night. The campsite has its own shop for most of your needs and you can get in an out of the city by the regular bus service or by the free ferry behind Central Station, if you rent a bike for your stay. There are also many low cost hostels and hotels in the city, if you rather your cheap Amsterdam break with an actual roof over your head. These places tend to be basic but clean; no fancy hotel restaurant, but four walls and somewhere warm to sleep. Both Travel Hotel Amsterdam and Hotel Ben on Beursstraat, at the edge of the Red Light District, just south of Central Station, are great low cost options with good locations. There are many gourmet restaurants in Amsterdam, where wealthy people pay huge amounts of money for tiny amounts of delicate food, but there are also plenty of cheap and cheerful places to grab a bite for those of us on a budget. No cheap Amsterdam break would be complete without a trip to Febo. These little yellow fast food outlets can be recognised by their distinctive banks of coin operated food dispensers. Just pick your burger or croquette, slide your coins in and try not to think too hard about how long it's been sitting there. One good trick is to wait until you see a fresh burger put in and pounce on it while it's still fresh. 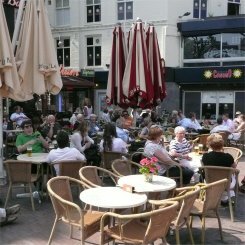 The area in and around Leidseplein is full to bursting with low cost restaurants. Wandering these narrow streets will present you with boards on every wall screaming their offers of EUR 5 for any pizza, pasta etc. While no culinary delight, these places offer decent food at good prices and are well worth a visit as part of any cheap Amsterdam break. In good weather, eating outside on the street or in parks is a great cheap way to keep fed. The little convenience stores that are dotted throughout Amsterdam can sometimes be pretty expensive, especially the ones in the centre and near the Red Light District, so a trip to the ever-present Albert Heijn supermarkets can be the best way to get cheap food in Amsterdam. The blue and white AH sign can be found on most major streets and there is a large outlet right behind the Royal Palace on Dam Square. Of course, the cheapest place to get food in Amsterdam can be at the outdoor markets such as the Albert Cuyp Markt in De Pijp. Food available at these markets can be cheaper and better quality than you would find in a supermarket and wandering the stalls all day is a great past time for any cheap Amsterdam break. Or check the dirt cheap Aldi supermarkets in Amsterdam. A great cheap thing to do in Amsterdam is to rent a bike and spend your time exploring the outlying areas. The cost of hiring a bike for a day or a week can be quite low compared to spending the day in town, and with a bike you can visit the many windmills and forests to be found just outside of Amsterdam. For a well priced bike option complete with tours and picnic baskets, visit Star Bikes at De Ruyterkade 127, to the east of Central Station. 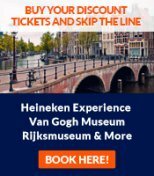 The many art galleries in the Jordaan offer a free way to spend the day and can make your cheap Amsterdam break as culturally stimulating as if you had paid the high prices to enter the Anne Frank Huis or the Van Gogh Museum. Ten Haaf Projects at Laurierstraat 248 or Gallery WM at Elandsgracht 35 are just two examples of great galleries that show local and international art free to the public. In summertime, the Amsterdam Film Museum offers open air movie screenings that are a great way to spend a cheap evening. In their current, Vondelpark location the films are projected onto a large inflatable screen just outside the museum's terrace and folk can sit at the café and order drinks or just squeeze into a space on the ground and watch the movie. The museum is set to move to a new location in Overhoeks in 2011, but will still continue to show outdoor screenings.